Kay, 9, is sitting in my front seat telling me kid's dumb jokes from a book of kid's dumb jokes (i.e. "why do nuns like Swiss cheese?") while we wait for DM to climb in the back. As soon as he hears that we are telling jokes, he bursts into a dimpled smile, waves the too-long sleeves of his mud-stained hoodie and announces that he has a good joke...but it's a little "unappropriate." "That's fine. It's OK since we're in my car," I say, not expecting anything more inappropriate than a pun on the word "bare." DM: Why did the squirrel always swim on his back? DM: To keep his nuts warm. I like a dirty joke just about as much as I like a dumb one, and I like getting both together. I laughed myself to tears, mostly because I wasn't expecting any nuts, and then I felt required to say, " Let's not re-tell these jokes outside this car, OK?" So many days at work feel hopeless; the lesson planning and "I-statements" prove futile. Then there are these occasional moments when the kids crack me up and remind me that they're just kids... and that I'm really not all that different. I've been finding it tough to stay light-hearted amidst the frustration. Lately, I've been trying to focus on these moments to stay afloat when the emptiness of being a disciplinarian starts to overwhelm me. 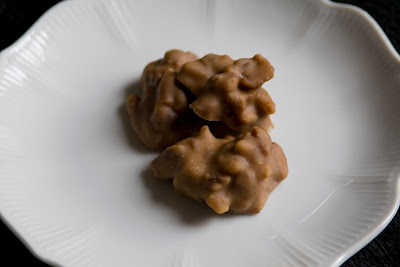 I had an analogous experience yesterday when making these pralines. Despite all the effort and listening to the candy thermometer exactly, the candy didn't set. I was left with a sugary puddle and soft-ball-stage rage bad enough that I had to restrain myself from hurling molten lumps of pecans across the kitchen. I don't know why they didn't set since I thought I did everything right. Perhaps the universe is playing a joke on me, or the moisture from the rainy day seeped in, or perhaps my already foul mood polluted the mix. Apparently, you can't get sugar to behave with bitterness. Anyway, after yelling at the thermometer, the syrup, the butter, and the dog, I managed to cool off and take a break from it. I had to remind myself that after all, it's just nuts. Came back a few hours later, poured the sweet ooze back into the pot and started over, with patience. This time they set fine. So, these pralines continue with the sweet-salty-rich combo that I noted last post and also ride the bacon-in-everything trend. They use Shirley O. Corriher's trick of adding corn syrup, which makes them fool-proof (supposedly) in that they won't get gritty too fast. In fact, they don't get gritty at all. They are more creamy than the usual grainy, sugary pralines. 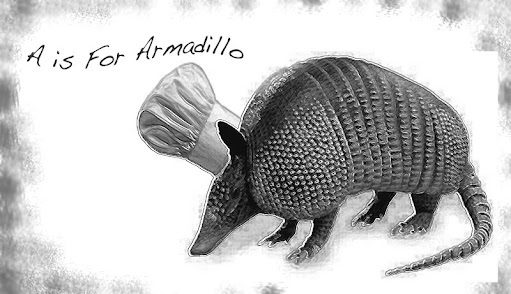 The bacon flavor in the batch I made was a little too subtle, so I upped it in the following recipe. 1. Preheat oven to 350 °. Place some foil on a couple of baking trays and grease with butter and spray. Set aside. 2. Toast pecans on a baking sheet until gently browned, about 8-10 minutes. Stir in 2 T of butter while the nuts are still warm. 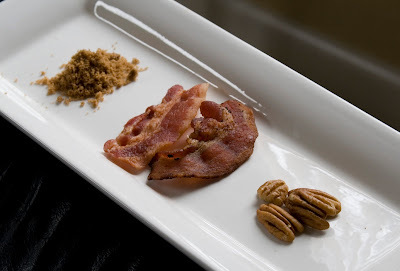 Add bacon crumbles to the nuts. Set aside. 3. Combine the brown sugar, white sugar, syrup, milk, and 2 T butter in a heavy saucepan over medium heat, stirring until everything is dissolved. Add the nuts and bacon. Clip on the candy thermometer and low boil, stirring only if needed, until the mixture reaches high soft-ball stage (238 °-240°F). 4. Remove from heat and let stand, undisturbed for 4-5 minutes to cool a little. Then, add the vanilla. Beat with a flat wooden spatula until noticeably thicker. Don't skimp here. Your arm should get tired because it's thickened. It took me about 10 minutes but might take you less if the weather is drier. Then quickly spoon pralines onto the buttered foil to set. Store in an airtight container.